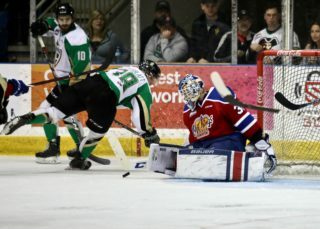 RAIDER REVIEW: The Raiders (11-1-0-0) welcome their first US Division opponent tonight when the Spokane Chiefs (6-2-1-2) make their only trip to the Art Hauser Centre this season. 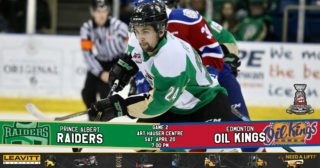 On Tuesday, the Raiders defended home ice by doubling up the Calgary Hitmen 4-2. Brett Leason had another big night for the Raiders, picking up two goals and two assists. Sean Montgomery also had a goal and two assists. Carson Miller, Justin Nachbaur, Brayden Pachal, and Sergei Sapego also had multi-point nights. VS. SPOKANE: Last year, the Raiders fell 7-0 to the Chiefs in Spokane at the Spokane Veterans Memorial Arena. 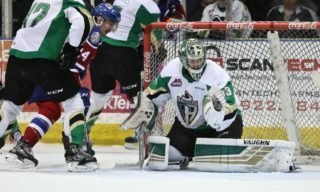 Former Chief and current Raider Donovan Buskey earned the shutout in goal for Spokane. In the Chiefs’ last visit the Art Hauser Centre, Spokane earned a 4-2 win on October 28, 2016. Cavin Leth and Brendan Guhle found the back of the net for the Raiders. The last time the Raiders beat the Chiefs at the Art Hauser Centre was on Feb. 11, 2015. VS. US DIVISION: Last year, the Raiders went 1-4-0-0 as they made their trek through the US Division last November. The lone win came against the Seattle Thunderbirds. CENTURY MARK: With three points in Tuesday night’s win over the Calgary Hitmen, Sean Montgomery reached the 100-point plateau. The overager from Calgary is second in team scoring with four goals and 11 assists, behind only linemate and fellow Calgarian Brett Leason. 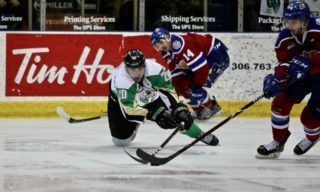 TOPPING THE RANKINGS: On Wednesday, the Prince Albert Raiders moved up to the No. 1 spot in the Kia CHL Top 10 rankings. It is the third consecutive week that the Raiders have been in the rankings. REPRESENTING THE WHL: Parker Kelly, Brett Leason, and Ian Scott have been named to Team WHL for November’s 2018 CIBC Canada Russia Series. The three Raiders play games against the Russia’s national junior team on Nov. 5 and 6 in Kamloops and Vancouver, respectively. Leason leads the Raiders with 11 goals and 15 assists; Kelly is averaging a point per game to start the year; and Ian Scott has a 9-1 record with a 1.60 GAA and a 0.943 save percentage. CALLED FOR CANADA: Raider rookies Kaiden Guhle and Ozzy Wiesblatt were named to Canada’s roster for the 2018 World Under-17 Hockey Challenge in November. They were two of 66 players chosen to represent Canada at the annual event, which will have three Canadian teams – Black, Red, and White. The tournament runs from Nov. 3 to 10 in Saint John and Quispamsis, New Brunswick. ROSTER MOVES: The Prince Albert Raiders recalled 2000-born defenceman Konrad Belcourt from the AJHL’s Fort McMurray Oil Barons. The move comes after defenceman Max Martin received a three-game suspension under supplemental discipline from the WHL. Martin is eligible to return to the lineup on Oct. 27 against the Regina Pats. 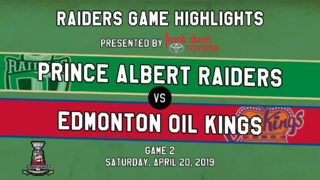 NEXT UP: The Raiders take on another US Division foe on Saturday night when the Everett Silvertips (6-4-0-0) head to Prince Albert for the only matchup of the year. Puck drop is 7 PM. Tickets are available at raiderhockey.com.